One of the benefits of taking a break from the Facebook Pin Loom Weaving Support Group is that I now have leisure time to explore. Without noticing, I’d practically left off embarking on personal pin loom weaving adventures. 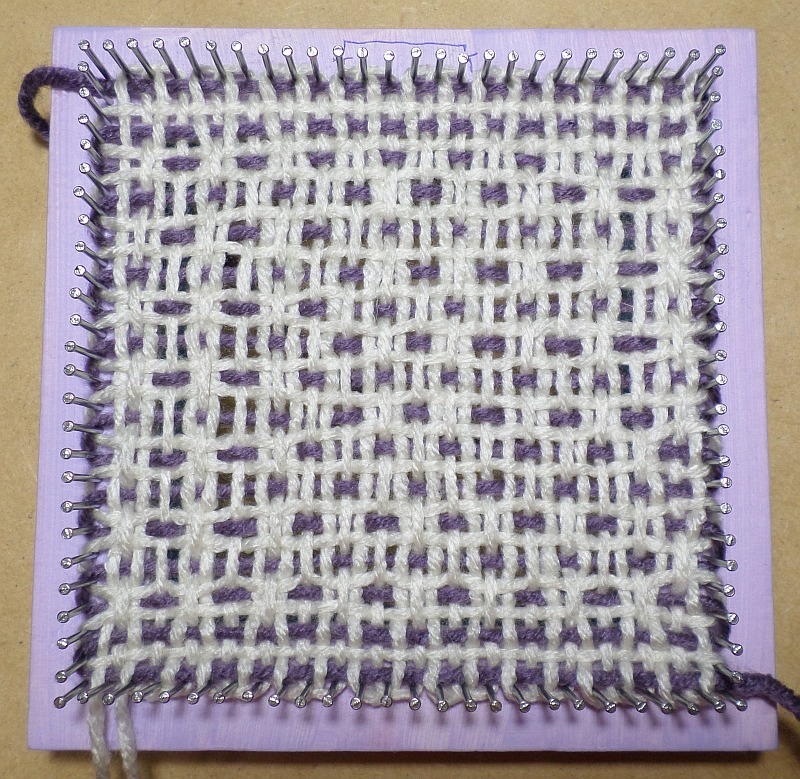 My current adventure is to explore weaving with thicker yarn than the standard Weave-It, or Wunderwag, loom can handle. My ultimate purpose is to design a loom that will allow me to use some of my thicker-than-standard handspun yarn. The 3-layer warping and weaving method for this loom is a bit weird, as it usually is with equidistant pin looms*. I had to fiddle with it to make it work; beginning and ending locations for each layer were different from those of the Weave-It. For example, L1 ends at Cr4; L3 ends at Cr1. For my first attempt I used worsted weight (category 4) yarn and followed a modified U3, O1 pattern. Most category 4 yarn works quite well on the Weave-It, but some is a bit on the too-thick-for-comfort side*. I was unsure how the yarn would weave up; it turns out I warped it too loosely. 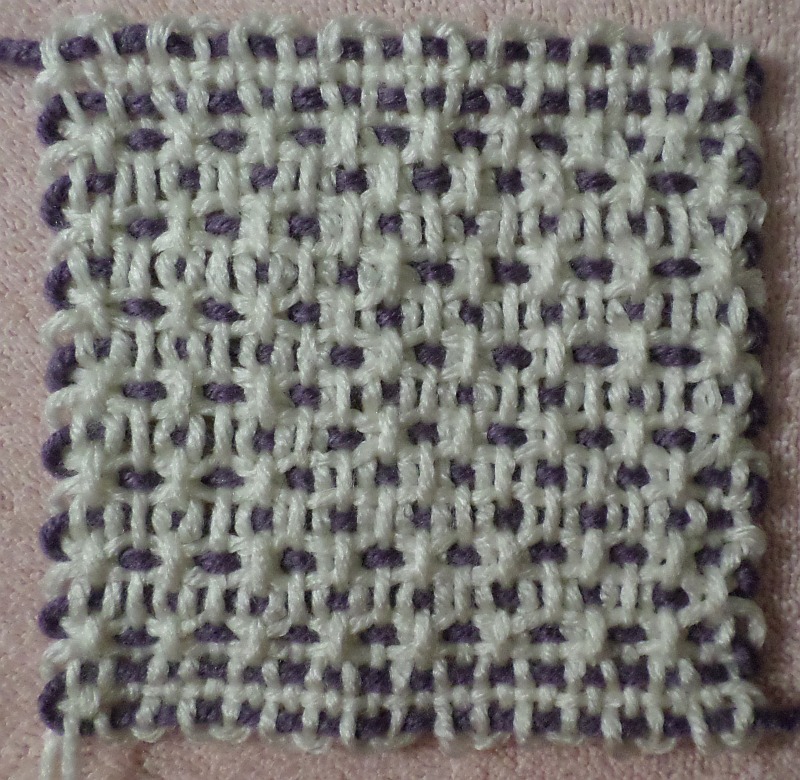 I think the finished square would have looked better if I’d tightened up a bit (don’t pull it taut, just leave no slack). On the next square I used Big Twist Chunky (#5 weight category). I warped the way I described above—no slack, but not pulled tight. So far, so good. I’m confident it will remain easy to weave to the end. 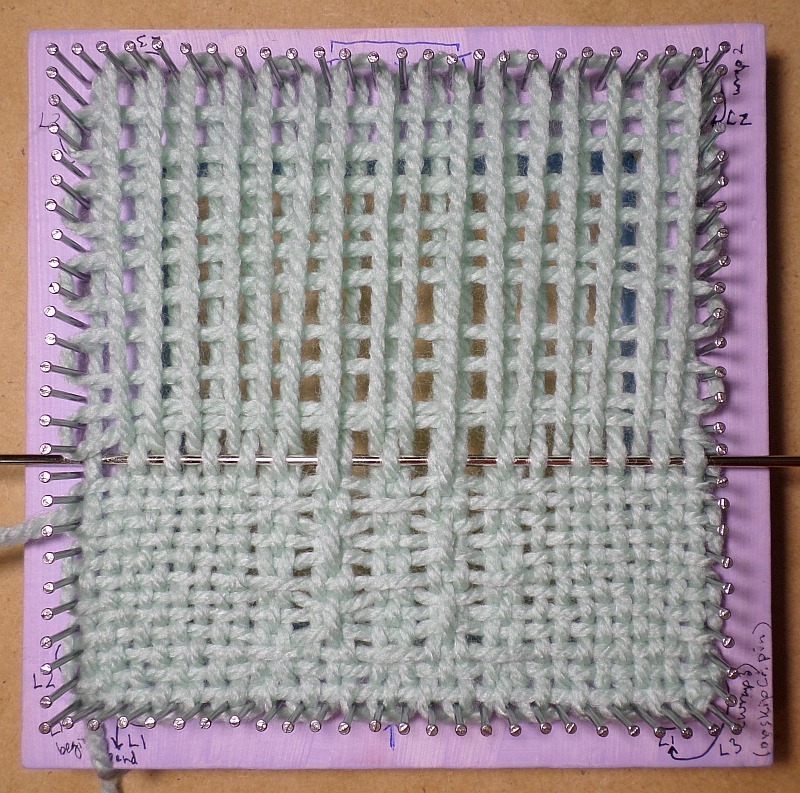 Because this is a panel pattern, you can use it on any loom; just adjust the number of stitches necessary to keep the pattern centered. 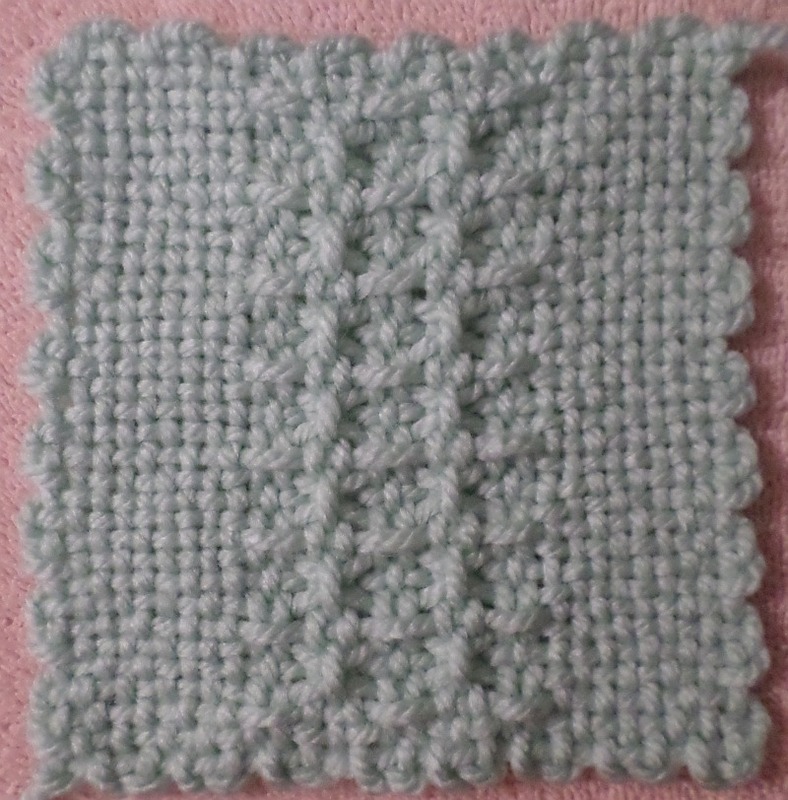 On even rows, you need to center 15 stitches (O3, P3, O3, P3, O3); on odd rows, center 9 stitches (U3, P3, U3). However, for the Weave-It/Wunderwag looms you’ll have to change the stitch order*. I look forward to further adventures with this wider sett type of loom . . .